Get Springsteen's new collaboration on vinyl! 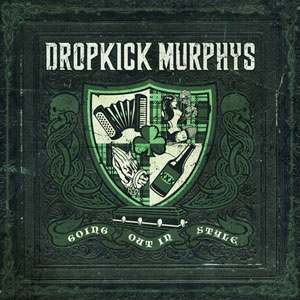 Released on double LP by Born and Bred Records, the Dropkick Murphy's Going Out in Style features a Springsteen co-vocal on the Irish rave-up "Peg O' My Heart." White, 180-gram vinyl in a gatefold package, includes a copy of the album on CD as well! On their seventh full-length studio album, DKM are throwing a 45-minute, 49 second party to end all parties, all the while reveling in the Irish Tradition of telling tales of triumph, tragedy, and celebration through music. These songs take the band's own personal experiences and family folklore and roll them into the story of one fictional character, Cornelius Larkin. Fueled by fiery riffs and unforgettable choruses, Going Out in Style traces the journey of Larkin, whether it's the Irish immigrant's first person account of his own wake or the band's in depth interpretation of his life and lineage throughout the album's lyrics, all propelled by the band's fusion of Celtic and punk.